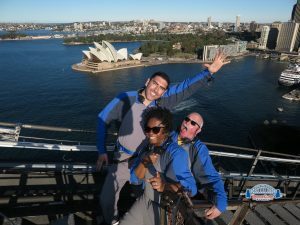 This afternoon, our small, fearless subgroup climbed up the Sydney Bridge. 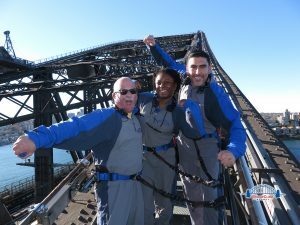 What, for me at least, was going to give us another vantage point on the breathtaking Sydney Harbour became an education on human ingenuity. 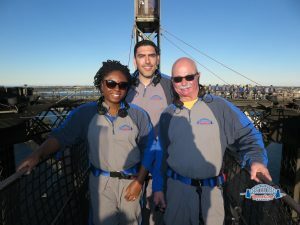 The three of us were impressed by the amount of preparation before the climb– waivers, a breathalyzer, metal detector and removal of anything that could fall and strike moving cars below. I was excited about climb, the the height is nothing to scoff at. Seeing the seriousness of the safety precautions, our nerves melted away. After donning jumpsuits, harnesses, handkerchiefs, and caps, and practicing our climbing technique, we set foot on our 3 hour journey. We assumed the emphasis would be on the climb, but we were pleasantly surprised at the lecture we got while we walked. The bridge has 6 million rivets, and all of the original ones are still in place, thanks to the work of an inspector who checked each and every one. There are two flags at the top of the bridge: the Australian and New South Wales flags. Each cost roughly $2,000 and is the height of a double decker bus. At one point, discussions were had about building a new bridge because it would be more economical than upkeep. It was decided to to do the latter because of how important this original bridge is for tourism and a regional identity. 16 people fell off the bridge and died during construction due to the force of impact hitting the water. In the 1930s, there were no harnesses or any semblance of the precautions we took today. Only one person fell off and survived because he threw his tool belt into the water to break it up, and entered the water with his body straight as a board. The impact was enough to push his shoes up his thigh, and the sole of one shoe was lodged into his heel. After surgery and a couple of weeks of recover, the dedicated worker returned to work. We marveled at how safe we felt throughout our trek. When we were done, we felt exhausted but full from the fresh air, the sun, the views, and the history. The whole group starts our day tomorrow with a tour of the Sydney Opera House, visible from the picture below.